Product prices and availability are accurate as of 2019-04-17 19:07:23 EDT and are subject to change. Any price and availability information displayed on http://www.amazon.com/ at the time of purchase will apply to the purchase of this product. Wide, shallow design brings sauces to a boil quickly for faster reduction, and curved walls make stirring easier. Steam vent in lid helps prevent boil-over. No metallic taste! 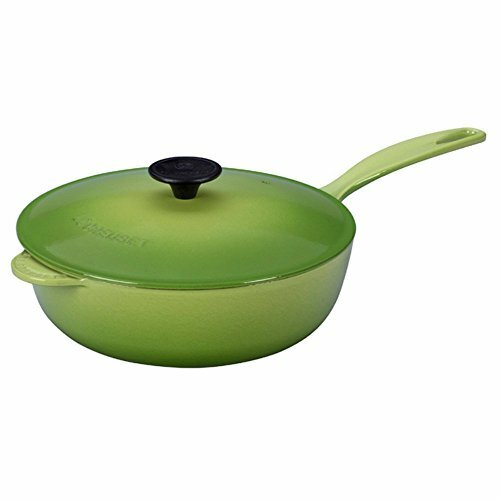 The mainstay of French chefs for nearly a century, Le Creuset cookware features bold and bright colors in a variety of shapes and sizes to suit any culinary need. Each cookware piece is skillfully finished by hand. 3-quart capacity. 8 lbs.9 3/4" Dia. (17 3/4" w/ handles) x 3"H (4 3/4"H w/ lid). Crafted from strong and durable cast iron Long-lasting external enamel Durable, nonreactive interior enamel Beautiful and brilliant color Measures 17.75L x 10.25W x 5.25H in.